I stumbled across an old interview with Gary Wolf, the author of the original novel Who Censored Roger Rabbit? My favourite little bit. I can say that Bugs has a tough agent. He and Mickey had to appear on screen for the exact same amount of time, they had to be in every scene together, and they had to have exactly the same number of words of dialog. Alfred Pennyworth has so much in common with Jeeves. Via @acrylicist, I learn about PasswordCard, a cunning little web utility that helps with the problem of remembering lots of strong unique passwords. Frustratingly, I find it almost useful. But I have some ideas for how to make it so that it would be a great solution for me, and I think a lot of other people. 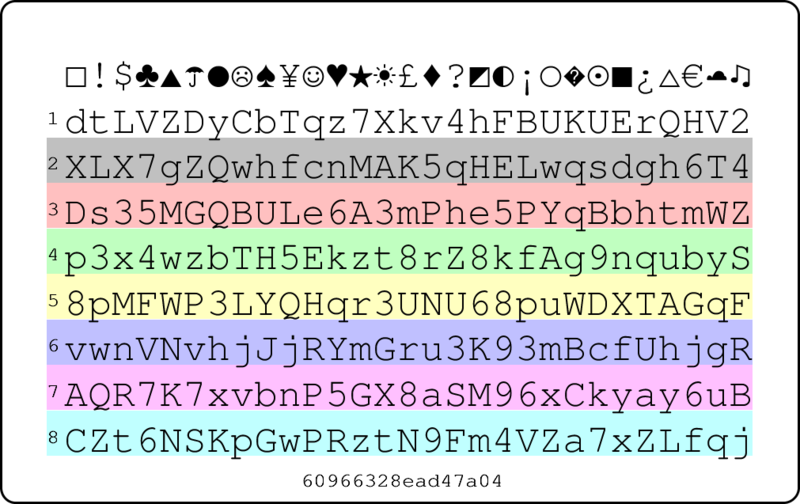 So if you use 8-character passwords and read to right-to-left, and you remember that your Facebook password is “green diamond”, then you know that your Facebook password is r8tzkE5H. It's a very clever idea, but I have a problem with it. 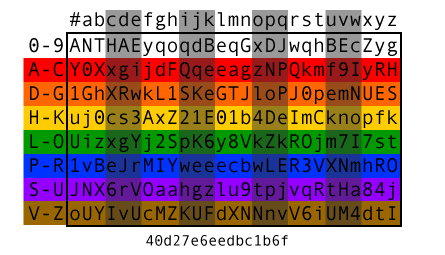 You need to remember the color and symbol for each password you have. If you're like me, you have a lot of passwords; I would not feel confident that I will remember the mnemonic for every password I create. 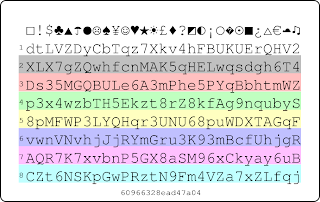 With the grid organized this way, you can have the name of the thing for which you need a password act as the mnemonic that tells you where on the card to start. So let's say you do the first letter of the name of the site from the top list of columns, and the second letter of the name of the site from the side list of rows; that makes your Facebook password jdFQqeea. This makes your passwords a bit more exposed if someone gets hold of your card, since the key mnemonic isn't in your brain, but you could be clever about where you start: instead of the first and second letters of the site name, you could use the third and fourth ... and shift over by two from there ... and so forth. For folks who still want to use the card the old way, I've left the colored rows. The weird extra set of characters at the bottom of both formats of card is a seed number which will produce the PasswordCard again at the website. That way, if you write down just that seed number somewhere secure, if you lose your PasswordCard you can reproduce it exactly. But it would be nice if you could use any arbitrary key you want, that you already have memorized, and then have the option to leave that off of the card. The New York Times Magazine offers us a beautiful piece: Fourteen Actors Acting: A Video Gallery of Screen Types, a series of little vignettes. They offer about the minimum of what you need to qualify as “cinema:” each features a single actor shot in black-and-white in a single take that lasts about a minute, with a simple music score. Each repeats a cinematic trope you'll undoubtedly recognize. I have a soft spot for this sort of thing in part because it provokes a confrontation with the nature of the medium. How little can a scene contain and still tell us something? What comes from story, and what from pure action? Why do we love these iconic scenes so much that we create them again and again in films? What makes them work? And what makes them work again and again, in countless movies, without becoming stale? And Michael Douglass provides an utterly compelling performance by pretty much just sitting there. Which brings me to If We Don't, Remember Me. When I started writing this post, I had meant to call it a different take on the same project, but I realize that in truth it has a profoundly different project. Remember offers a series of animated GIFs made from great movies. I ordinarily think of animated GIFs — a technology for showing brief looping animations — as the scourge of the web, but Remember does something marvelous with them. Stills taken from movies generally seem surprisingly sterile; movement plays such an essential part in what makes well-composed film shots work that taking a single frame out, even if we choose carefully, loses much of the magic. Remember gives us not stills but what we want from stills: a single, atomic moment, including the essential movement. And by essential movement, I do mean essential: often the faceless author of Remember has included only the movement in one part of the frame, or has the image hold perfectly still for a second or two before showing something small move in a flicker, or includes just a tiny sway or flick of an actor's eyes. The moments captured by Remember don't really show us acting at all, I think. Acting means revealing a character through action. (There it is, lurking in the word itself!) The moments of Remember don't do that, they show no progression, else they would not work as endless loops the way they do. But they often do show a thing that film actors do — the thing that Michael Douglas did in his Fourteen Actors clip — which has only a loose connection with acting: exhibiting screen presence, that subtle and mysterious quality by which some actors can hold our attention. Some actors, indeed, have very modest acting abilities but an extraordinary screen presence: think of Arnold Schwarzenegger, Ruth Gordon, Keanu Reeves, or countless classic-era stars like Bogart, Hepburn, John Wayne, Rita Hayworth, Jimmy Stewart. I suspect that skilled actors can cultivate this, but some actors just have it. Update: I cannot resist adding a little video essay of closeups, plus these animated movie posters. Update: Tech Noir is another collection of almost-stills like If We Don't, Remember Me, and Scènes Cultes de Films en GIFs Animés is similar, with little GIFs.